With many sea lives, pristine corals, fringing reefs, wrecks and great underwater visibility, offering a real paradise of diving and bring you to the closet deep sea world. If you are looking for experienced of underwater world where is peaceful, serenity and beauty hiding with an unforgettable memory, join us in the adventure of a lifetime! H2O Sportz The most complete selection of diving, snorkeling and Sailing with a wide selection of PADI scuba diving courses from beginner to divemaster, including many specialties. 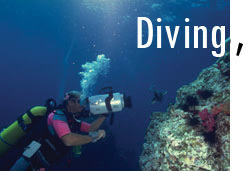 was founded with specialize in resort diving experience. We offer veritable the fascinating dive sites around Phuket Island through a breathtaking underworld water of colorful marine life. H2O Sportz is proud to present that we are PADI 5 star Gold Palm Resort Dive Centre, guarantee of safe dive, professional equipment and our boat charters service. Feel an unimaginable excitement to enroll in a PADI course allowing you to progress at a pace you are comfortable with. We are committed to small group size and prefer to help you learn in a more relaxed and enjoyable atmosphere. Begin to explore the silent under water world with your professional PADI instructor, the PADI learning system start with PADI Discover Scuba Diving Program, Scuba Diver program, Open Water Certification Program, Adventure Diver, Rescue Diver course. The countless of beauty awaiting visiting at many exotic dive sites. You can start from a beginning a discover scuba diver and move to the expert divemaster. 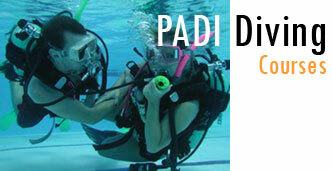 Easy learning with four levels of PADI program that will bring you to a professional diver. Each contains diving techniques to use in a real situation. 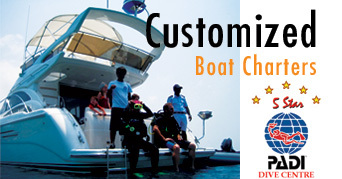 Welcome to an exclusive destination on boat charters, cruising in uncrowded ocean. Choose from the different boat characters, visit an unlimited renowned islands including somewhere unexplored or make your own day of diving, snorkeling, fishing, sightseeing.